Fractal-quality effects in a floor unit designed for use with an amp. In comparison to the original FX8, the new Mark II has an all-black aircraft aluminum bezel and end panels, improved top-panel silkscreen design, an 18dB instrument input pad option, and an even lower noise floor. Use Stompbox Mode on the FX8 for traditional effect “tap dance” switching, or leverage the eight SCENES in each preset to engage pre-defined effect combinations from a single switch. Many effects also offer “XY” switching, which gives them two completely different sound settings: imagine dialing in a single drive pedal with both “Overdrive” and “Fuzz” channels, or a reverb with foot-selectable “spring” and “hall” sounds. Scenes provide a kind of control very similar to traditional “loop switcher” rigs. The fantastically flexible modifier system enables easy real-time sound changes. You can connect up to two expression pedals (like the Fractal Audio EV-1) to control Wah, Whammy, Volume, or virtually anything else. Utilize MIDI or onboard controllers for automated dynamic effects. A precision tuner, two global equalizers and a dedicated, global 4-minute stereo Looper are also built-in. 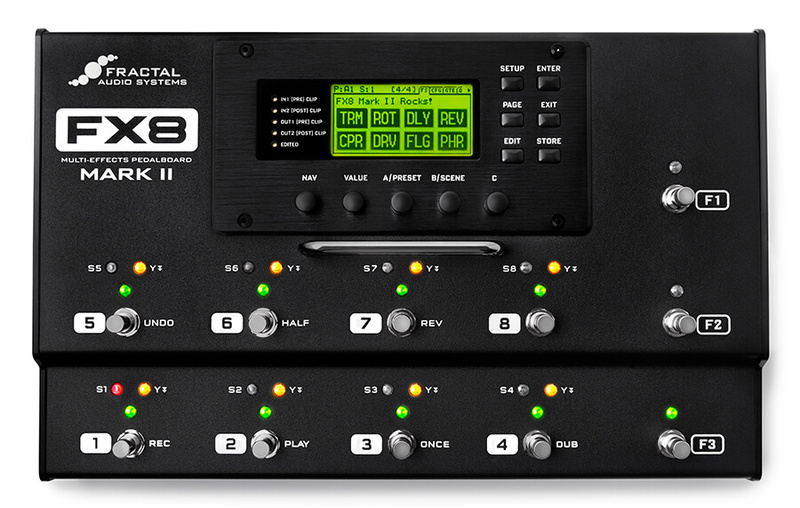 The FX8 offers a stunning array of stompbox and studio effects, all based on the effect algorithms made famous by our Axe-Fx II line of processors. Effects are placed as “blocks,” many of which can be configured as various effect “types”. For instance, the DRIVE block includes simulations of 34+ different fuzz, overdrive, distortion, and boost pedals. The DELAY block offers types for analog, digital, tape, and more.